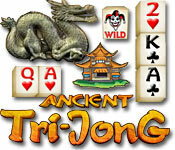 Ancient TriJong is rated 4.2 out of 5 by 6. 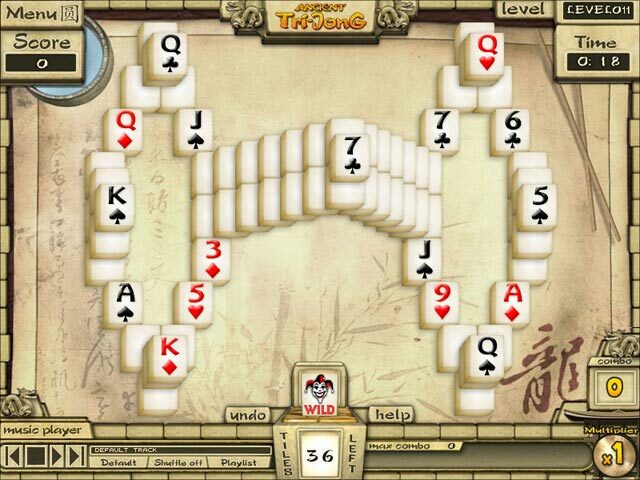 Rated 5 out of 5 by Lyndy20 from Addictive Game This game mixes Mahjong layouts with the 1 up 1 down style of solitaire. There are two modes, Quest and Survival. 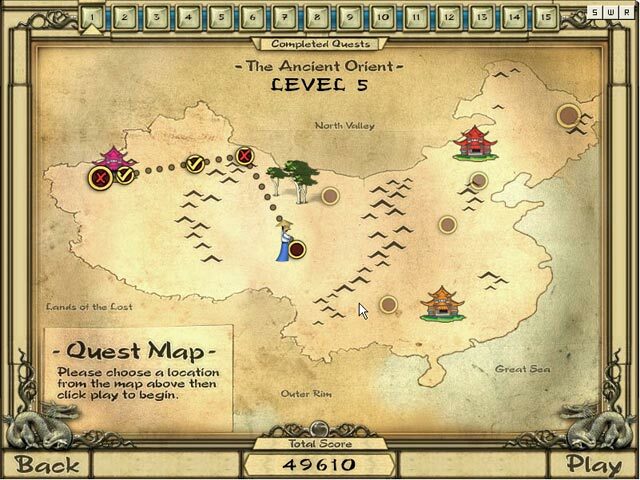 In Quest mode, there are 150 levels split into 15 sections. Each section has 10 levels, containing a mix of easy, medium and hard layouts. Some layouts are challenging, requiring a few revisits to beat, but you don't need to win every level to progress. Graphics are ok, simple, no frills. Tiles are good size. I haven't sampled Survival mode - too busy in Quest Mode! Definitely a game that will keep you entertained for a long time! Rated 5 out of 5 by cityedge from Uniqie! Hybrid of Mahjong and Tri-peaks! This is a great game. If you love both mahjong and tri-peaks card solitaire, you'll also love this, because this is a hybrid game of them. 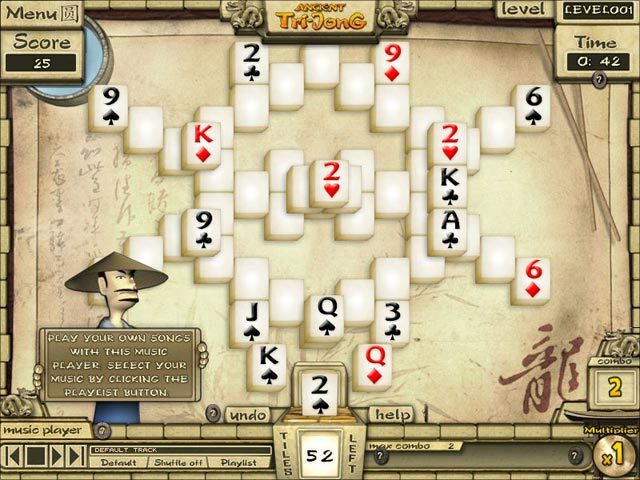 Tiles you can access (select) are limited to ones whose side is open (mahjong-like). You can remove tiles 1 value higher or lower than the last removed tile (tri-peaks-like). There are many layouts enough, game difficulty is appropriate, game system is reasonable. This game is really unique and addictive. If you want to play a new-type solitaire game, this is the one. Rated 4 out of 5 by Marjoleine13 from Good Entertaining and relaxing. Liked it. Rated 3 out of 5 by mrm2006 from Best Continuous - 107 tiles - YAY me! Most boring game ever. No storyline. When I play a Quest - I like there to be a storyline of some kind. Graphics: Ok. You have numbers and above (J, Q, K, A) in the four suits of cards on cream colored tiles - period. Sound: No sound effects. Background music enough to put me to sleep. Game Play: Basically, this is a game of solitaire using tiles instead of card backs. Because, really, you are playing with one or more (actually, quite a few more) decks of cards. Place one number higher or lower than that at the bottom of the screen and try to increase the number of continuous moves you have. I had 107 at my best. YAY ME! That's the whole game. I expected more. I mean, just the name, TriJong, elicits thoughts of ANYTHING other than what it was. Definitely a no-brainer for me that I am not purchasing this game. And, this is so rare for me, but I do not recommend anyone wasting an hour of their time playing this dud of a solitaire game.